Parents with children who are picky eaters, this book is for you. Little Dozy Bear only wants to eat fish and will not eat the other food his parents offer him. While everyone else is enjoying an after dinner nap, Dozy is still hungry and sets off to find his own fishy treats, but is convinced by new friends to try something different. Dozy quite likes the apple Hedgehog gives him, and discovers the blueberries from Owl are delicious and rather filling. As he crosses paths with animals, foods of various types and colours are soon on the menu. Soon Dozy has learned that eating food can be fun, and that it's 'how you eat it that matters, not what it looks like.' Dozy has discovered the secret of food and found that all kinds of food can be tasty. 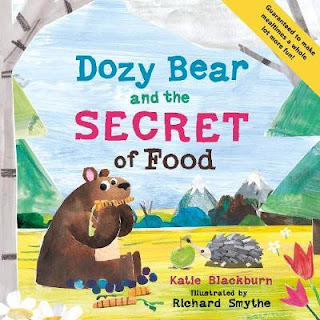 Just like in Dozy Bear and the Secret of Sleep, Katie Blackburn has written a story that hides its message in plain sight for children to enjoy and learn from, while also offering tips for parents. Both books are illustrated in a fun and friendly style by Richard Smythe. Katie Blackburn describes Dozy Bear and the Secret of Food as a 'toolkit to make mealtimes with a toddler less stressful,' and it should certainly make them more fun!